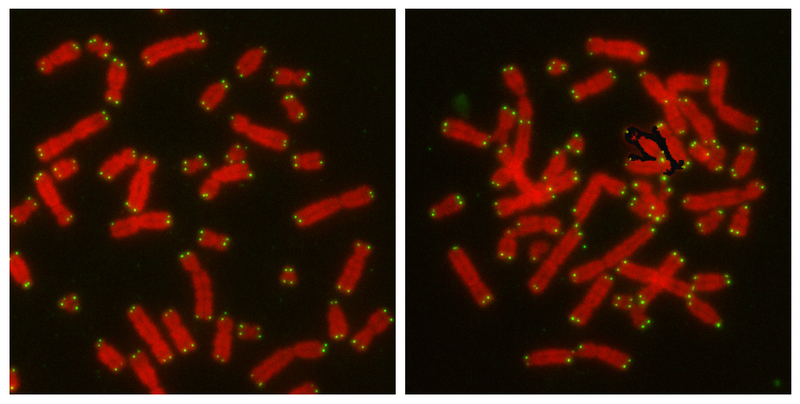 Chromosomes (red) with telomeres (green) that are undisturbed remain pristine and separate. 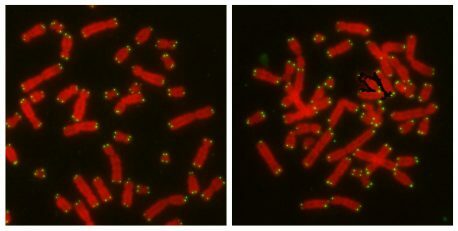 Right: when CYREN is absent, chromosomes that have been disturbed to artificially trigger NHEJ show fusions that are characteristic of repair after DNA is copied. LA JOLLA—Is it better to do a task quickly and make mistakes, or to do it slowly but perfectly? When it comes to deciding how to fix breaks in DNA, cells face the same choice between two major repair pathways. The decision matters, because the wrong choice could cause even more DNA damage and lead to cancer. Salk Institute scientists found that a tiny protein called CYREN helps cells choose the right pathway at the right time, clarifying a longstanding mystery about DNA repair and offering researchers a powerful tool that could guide better treatments for cancer. The work appears in Nature on September 20, 2017. This cartoon illustrates the suppressive effect of CYREN on the normally faster NHEJ DNA-repair pathway, allowing the slower HR pathway a chance to get ahead. Double-strand breaks, the most serious injuries that happen to DNA, can be repaired by one of two pathways: a fast but error-prone process known as NHEJ (non-homologous end joining) and a slower, error-free pathway known as HR (homologous recombination). The faster pathway efficiently rejoins broken strands, but in the case of multiple breaks it can join the wrong two ends together, making things much worse for a cell. The slower pathway is error-free because it relies on having an undamaged DNA sequence to guide the repair, but this means it can only operate after a cell has copied its genetic information in order to divide. Given that, the fast pathway operates exclusively before DNA is copied, though its machinery is so efficient and prolific that scientists have wondered why it doesn’t outcompete the slower, more-exact pathway after copying, too. Scientists have long suspected that something must be holding the faster option back in those cases. That something, the new work reveals, is a microprotein called CYREN, which inhibits the faster pathway when a DNA copy is available for the slower pathway to use. 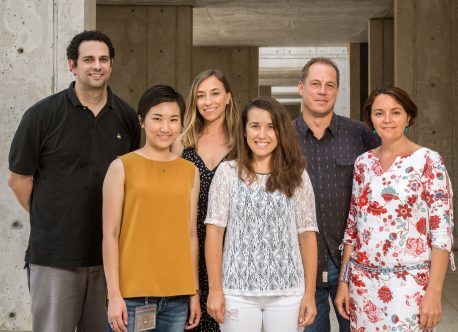 CYREN was discovered by another Salk scientist, Alan Saghatelian, as part of a 2015 effort to identify small proteins called “short ORF-encoded peptides” or SEPs, which are increasingly being found to have critical biological roles. Saghatelian’s research had suggested that CYREN was interacting with the master switch of the faster pathway, a protein called Ku. To determine the exact nature of the interaction, Karlseder’s team worked with a region of the genome where repair is normally suppressed to prevent dangerous fusions: the ends of chromosomes, called telomeres. Researchers can artificially disturb telomeres to activate the fast pathway, making it a model system to test CYREN’s effects. “Telomeres offer a great research tool because they really need to repress repair, but there are ways to activate the repair machinery so that you can study it in a very controlled way,” says Nausica Arnoult, a Salk research associate and first author of the paper. The Salk team did so, and found that with CYREN present, no repairs occurred after the cell copies its DNA, suggesting that it does flip off the master switch, Ku. Without CYREN around, Ku’s fast pathway was active both before DNA was copied and after. 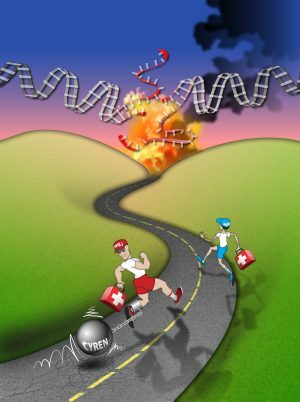 Because the telomere experiments did not tell the team much about the competition between the fast and slow pathways, Arnoult next used molecular tools to compare repair in living cells with and without CYREN. She combined the DNA scissors known as CRISPR with genes for fluorescent proteins that would be triggered by repair so that she could cut DNA in specific ways and see from the ensuing color which pathway had made the repair. She also analyzed all the protein interactions that took place. These experiments revealed that CYREN directly attaches to Ku to inhibit the fast pathway both depending on timing (before or after DNA copying) and the type of DNA break (smooth versus jagged, for example). Its activity can even tune the ratio of fast to slow repairs. Other authors included: Adriana Correia, Jiao Ma and Anna Merlo of Salk; Sara Garcia-Gomez, Marija Maric and Simon J. Boulton of the Francis Crick Institute; Marco Tognetti of ETH Zurich; and Christopher W. Benner of University of California San Diego. The work was funded by: the Human Frontiers Science Program, the Paul F. Glenn Center for Biology of Aging Research, a Larry Hillblom Foundation Fellowship Grant, a Wellcome Trust Senior Investigator Award, the Francis Crick Institute (Cancer Research UK), the UK Medical Research Council, the Wellcome Trust, the National Institutes of Health, the National Cancer Institute, The Leona M. and Harry B. Helmsley Charitable Trust, Dr. Frederick Paulsen Chair/Ferring Pharmaceuticals, a Salk Institute Cancer Center Core Grant, the Donald and Darlene Shiley Chair, the Highland Street Foundation, the Fritz B. Burns Foundation and the Emerald Foundation. Nausica Arnoult, Adriana Correia, Jiao Ma, Anna Merlo, Sara Garcia-Gomez, Marija Maric, Marco Tognetti, Christopher W. Benner, Simon J. Boulton, Alan Saghatelian and Jan Karlseder.